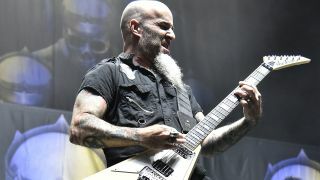 Anthrax’s Scott Ian has posted a video showing him unbox his official action figure. The guitarist has teamed up with NECA Toys for the figure, which is now available for pre-order. The 8-inch tall figure comes with a Jackson flying V guitar, three different heads – including a zombie head from his appearance on The Walking Dead – and detachable ‘horn hands’. Pre-orders for the action figure are now available, with the package signed by the Anthrax icon. Anthrax have several live shows planned throughout 2019. They’ll head to Australia, New Zealand and Japan next month, before returning for further dates in Europe – including sets at the UK’s Download and Bloodstock festivals.